How to Get Press Credentials - Press Pass - US Press Corps.Org. contact us: homeoffice@ainewsservice.net or 1-800-654-9557. Photographers - Journalists - Photojournalists - Videographers - Reporters - Editors - Producers - Bloggers - Broadcasters - Webcasters - Freelancers - and all Media-Press enthusiasts. Satisfaction Guaranteed. A+ Highest Better Business Bureau Rating. Press Credential Verification on the Internet you can update yourself. Custom Title (or No Title) on Cards. Custom Business or Media Name (or No Business Name) on Cards. Custom Flag (or No Flag) International Cards Only - Any Country Flag or UN or EU flags. EVENTS Our Members have covered with our Press Credentials. IFPO International Freelance Photographers-Journalists Org. Get Extra Sets by calling 1-800-654-9557. Extra Sets of credentials with initial enrollment are only $29.95. Get Extra Sets with different Titles or Media Names. Keep extra sets in your vehicles or with your equipment. Networking creates Opportunities, Assignments and Jobs. Using Press Credentials creates Networking. 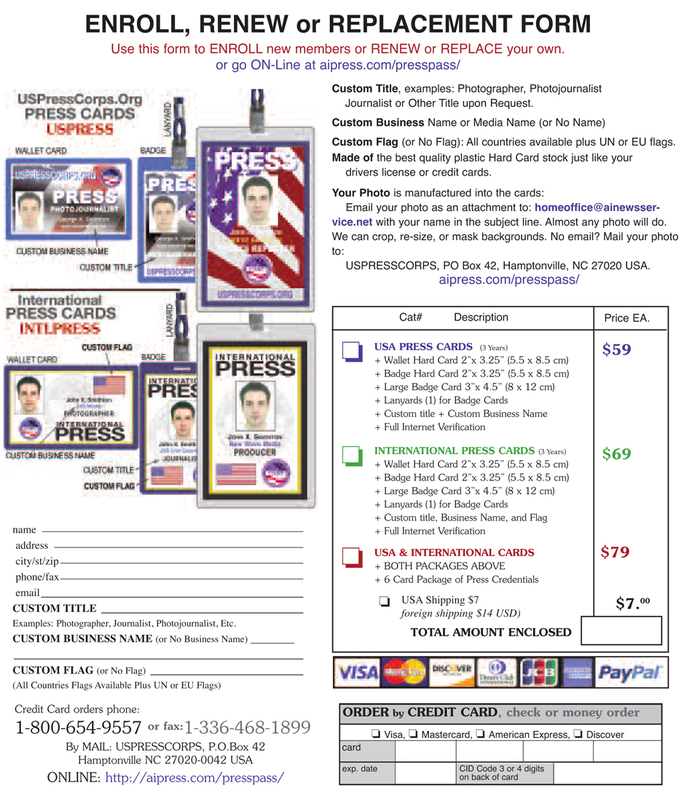 When you use your Press Cards, you will be interacting with media pros and decision-makers. at Sports Events at All Levels, Concerts and Other Entertainment Events, Celebrity Appearance Events, Press Conferences, Breaking News, Fire, Crime Scenes. UNIVERSAL ACCEPTANCE: Instant Prestige and Recognition, Proven Unrestricted Track Record, Elite Group of Journalists, Photographers and Other Media Pros. CONTACT US homeoffice@ainewsservice.net or 1-800-654-9557.